Diabolical Dynamics was the game for 2001. The competition consisted of four robots on the playing field for each match, aligned into one alliance. Each alliance worked together to try to score the most points in a two-minute match. This was one of the few games where there was not a competing alliance on the field at the same time. There were 40 small balls, 4 large balls, and 2 7-foot high goals with caster wheels that could be moved around the playing field. One goal started near the Start Zone, the other started near the End Zone, on the opposite side of the field. Dividing the field in half was an 18-inch high railing with a central bridge. Robots passed over the bridge or rails to access the opposite end of the field. The bridge was centrally supported on a beam approximately six inches wide, allowing it to tilt toward either end or remain level. 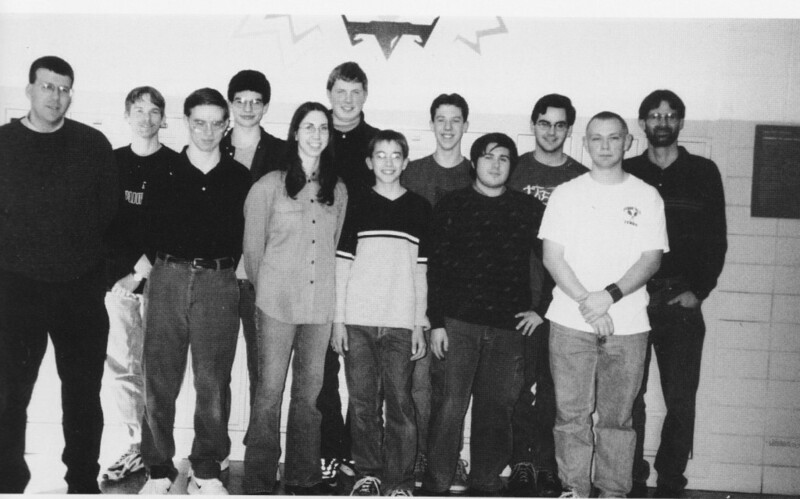 Lack of funding caused us to miss the 2000 FRC competition. New funding was found, and the team regrouped. 2001 was a new year, with a new team and a new team number. 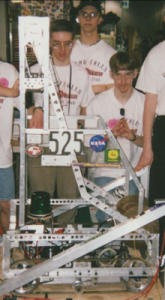 Team 332 became Team 525 (at that time, if you did not participate in a year, you lost your number). Finding a place to build was a struggle. We finally found an empty store in the local mall. It was somewhat heated and did not have much ceiling height but it worked fairly well. The team decided to build the robot with a track drive system to provide good traction and control when pulling a goal up onto the teeter-totter ramp. Bonus points were scored if the robot could balance the teeter-totter with the goal attached. The tracks idea was sound, but it didn’t work out as well as the team hoped. We learned a lot from the experience. The team enjoyed participating in the Lone Star Regional held in Houston.